Industrial batteriesdesigned for 2800 cycles at 50% DOD. 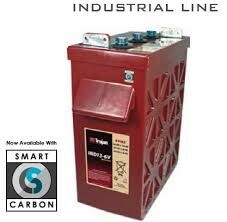 Trojans Industrial line of deep-cycle batteries are engineered specifically to support renewable energy systems with large daily loads where the batteries are cycled regularly. These high amp-hour capacity batteries are ideal for use in large off-grid photovoltaic (PV) systems, off-grid hybrid PV systems, grid-tied PV systems with battery backup, smart grid peak shifting systems and a variety of other applications. Alpha Plus Paste with T2 Technology which optimizes porosity development in the active material enabling the active material to be used more effectively. This results in sustained battery performance over a longer period of time. DuraGrid Design provides a thick grid structure that resists corrosion, and when combined with the Alpha Plus Paste with T2 technology, increases overall battery life. Reinforced Protection Wrap which is a five component wrapping and insulating system that includes an edge-protecting Koroseal with a plastic boot to protect the bottom of the plate. This advanced plate construction safeguards against shedding, and assures the electrochemical performance of the batterys active materials improving the batterys overall performance. Maxguard XL Separator is exclusively available in Trojans Industrial and Premium lines. It features a wide- channel design which increases acid flow for optimum battery performance and provides greater resistance to stratification, a typical mode of failure in batteries used in renewable energy systems.